The Wild West Knights' Rest Ranch is the year-round home of the Hanlon-Lees Action Theater. A dedicated 20-acre equestrian ranch, it serves as our permanent base of operations and staging facility while various company ensembles roam the countryside, entertaining millions. The Ranch is also a nationally recognized "horsey hotel," featured in the Nationwide Overnight Stabling Directory and also on HorseTrip.com. Click here for information on our stabling facilities! 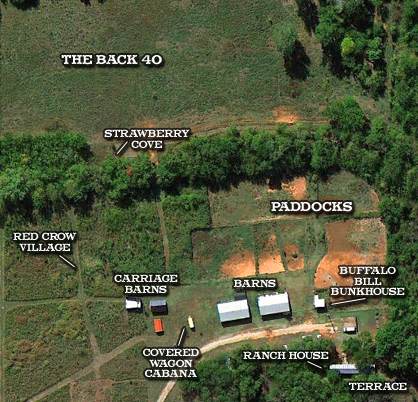 Click on the aerial map for photos of the ranch! Many of our props and costumes are on display here, as well as 10 pieces of rolling stock (including our custom-built "Stuntcoach") and nearly 100 saddles from literally dozens of different historical periods. The Ranch is also adjacent to the serene 37-acre Agape Retreat, where nature hikes offer an opportunity to explore and visit with local fauna such as beavers, owls, geese and many other denizens of the Oklahoma wetlands. If you're planning on boarding your horses or simply visiting the Ranch, give us a call at (405) 919-4056 for more information or specific directions. Please call at least 8 hours prior to your estimated arrival time. If possible, daylight arrival is preferred. Hope to see you here! We'd love to have you.